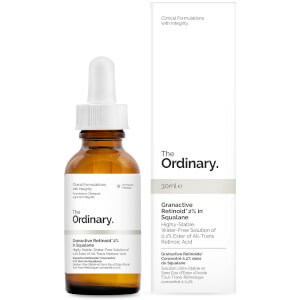 Address signs of ageing with the Retinol Serum 1% in Squalane from The Ordinary; a water-free, multipurpose, potent solution formulated to refine pores, reduce the appearance of dark spots and wrinkles and improve skin texture. Enriched with a 1% concentration of the anti-ageing powerhouse Retinol, which is a derivative of Vitamin A, the lightweight serum has a plumping and firming effect on the complexion, as well as protecting the skin from harmful environmental aggressors. Another key antioxidant ingredient Squalane prevents UV damage and the formation of age spots whilst counteracting harmful bacteria, leaving you with flawless skin. Please note: Retinoids can make the skin more sensitive to UV radiation. Sun protection is particularly important when using retinoids. This product must not be used in conjunction with other retinoids including retinol or retinoic acid. This product is not a treatment for acne. Acne-prone skin may experience a temporary increase in acne during the first few weeks of using any form of retinoid including those used in this formulation. This product targeted about 90-95% of my hyperpigmentation in about 6-8 weeks . It is a very good product , and I would recommend it . !